Seafood in Jamaica is second to none. Our spices have everything to do with that statement! Whether you eat at Hellshire Beach or anywhere in and around the island, our seafood dishes are mouth-watering. Check out these delicious seafood dishes by local restaurant Almond Tree Sports Bar located at 6 Garelli Avenue, off Trafalgar Road, New Kingston. Seafood heaven! 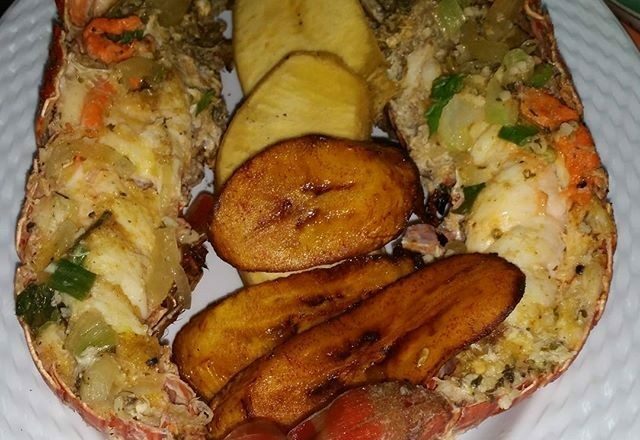 Garlic Buttered Lobster with fried plantains and bammy. Fried fish with Bammy and Plantains. Garlic Butter Shrimp with fried breadfruit and plantains. Did we mention fried garlic butter lobster with bammy? How about lobster with bammy and pear? Crayfish, Crab, and Conch READY! Shrimp Soup mixed with lobster. Streamed fish and fish soup are also on the menu!